This entry was posted on 1st November 2018 by WoodBlocX. There has certainly been a change in the weather over the past few weeks with most of the UK already experiencing some overnight frost. Whilst the heating will be on inside to keep you and your family warm some plants in the garden can benefit from some extra protection too. 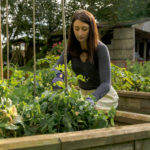 If you’ve worked hard in the garden this year or if you would like to carry on growing edibles over winter then you need to think about crop protection options. Protecting plants grown in containers is really simple; if the pots are light enough to pick up and carry they can be moved to a sheltered spot in the garden or placed inside a greenhouse. Plants such as dahlias should be lifted to protect them from the effects of the winter weather and stored in a dormant state in a greenhouse or shed. Other varieties that can benefit from lifting include pelargoniums, geraniums, begonias, gladioli and cannas. Spreading a good mulch around sensitive perennials will provide insulation and protect their sensitive root systems, a hardwood mulch is the best option, scatter it in borders and raised beds, building up a good protective layer, you could also use compost or straw. Don't wait until it is too cold to apply your mulch, add it whilst the soil is still moist and slightly warmer. Larger containers and timber raised beds can be protected from the wind, rain and frost by ‘overwintering’. Simply wrap a protective cover around the structure, different materials can be used from hessian to fleece, your local garden centre will stock a good selection and will be able to advise which is best for the plants you need to protect. You can protect your crops all year round with WoodBlocX Crop Protectors. These attractive, rustic and functional rods enable to keep pests such at bay in the spring and summer with a covering of netting or to fix winter fleece or hessian protection too. There are still crops that can be grown outside now in wooden raised beds, containers or open ground including onions, peas, broad beans and garlic. 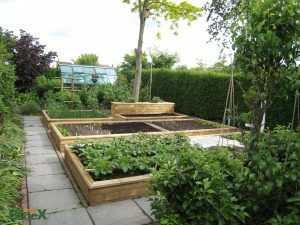 If you’re keen to get growing this winter check out our range of easy to build and hardwearing raised beds. Choose from all shapes and sizes to suit your garden.